I am a massive fan of Mahjong, a game which originated in China and is massively popular in the East, though it’s harder to find players in the West. It’s a game for four players involving skill, calculation and a good dose of luck and is played with an absolutely beautiful set of tiles which once would have been made of Jade and Ivory. Which Rules to Play By? I was introduced to it in my university days and played with what’s known as British rules, although there are loads of regional variations. When you buy a set in the West it usually comes with a pretty poor rule book that is badly translated from Chinese so that it’s almost gobbledygook. It got so complicated that I decided to replace it with my own British Rules Guide to Playing Mahjong and Scoring Sheet. I’m not saying these are official rules, just the way I’ve been taught to play. White Dragons are often blank. Give bonus points as well as doubling a score when it is associated with the players own Personal Wind. A complete set of Flowers or Seasons (known as a Bouquet) also doubles a score. A player collects sets of tiles called Chows, Pongs and Kongs throughout the play. The combination of these is a Mahjong. Can only be Balls, Bamboo or Numbers. Scores no points, but may help you end the game. A set of three identical tiles, e.g. 3, 3, 3. Can be Balls, Bamboo, Numbers, Winds and Dragons. A set of 4 identical tiles, e.g. 4, 4, 4, 4. Four sets and one pair of identical tiles. Ends the game and scores lots of bonus points. Only the player who ends the game scores points. This 14 doesn’t include any additional Seasons and Flowers collected. Seasons and Flowers are optional, so take them out now if you don’t want to use them. Some Mahjong sets have blank spare tiles in them, so take those out, but check first that they are not the White Dragon tile as these are sometimes blank tiles. Place the tiles face down on the table and shuffle them. Make a square Wall which is two tiles high and 18 tiles long, overlapping each corner. If you’re not using the Seasons and Flowers, it will be two tiles high and 17 tiles long. Roll a dice, the highest scoring player is ‘East’. 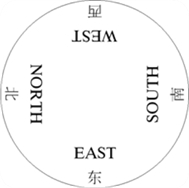 The other players take directions relative to the East player, so the player to the right of the East player is South, then to the right again West and finally North. Each player should note their Personal Wind and the Flowers and Seasons that correspond to it as these will give them additional bonuses. In addition to the players having a Personal Wind, every game has a Prevailing Wind, which determines points and score multipliers at the end. The first four games are played with the Prevailing Wind being East. It may change after that, see “Ending the Game” below for more details. Some Mahjong sets have a dice marked with the Winds which can be displayed somewhere visible to all players to show which Wind is prevailing during each game. The East player rolls a dice to determine the starting position on the Wall. Count the number shown on the dice from right to left and starting with their Wall. The person whose side it lands on becomes the dealer. That person stays the dealer until they lose a game, at which point the winner becomes the dealer. The dealer rolls two dice. Count the number of heaps (piles two tiles high) shown on the dice from the right-hand edge of the dealers Wall. Take the next heap and remove it, putting them on top of the counted tiles. Separate this set if you want to create the Kong Box. This is used to give extra tiles to players who create a Kong or to replace a bonus Season or Flower tile. If betting or using the tally counting sticks, at the beginning of the session give each player 2,000 points in tallies. If tallies are not available then a score sheet can be used which each player starts with 2,000 points credit. The dealer gives themselves the first two heaps (piles two tiles high) from the Wall next to where the Kong Box was created. The dealer then gives the next two heaps to the player to their right, the next two heaps to the next player and so on until all players have 6 heaps. The dealer then gives themselves an additional two tiles and everyone else an additional one. The dealer should have 14 and everyone else 13. Players can organise their tiles so their faces are hidden from the other players. The Season and Flower Bonus tiles don’t count towards a player’s main hand of tiles and must be displayed face-up in front of their concealed hand. If a player picks a Flower or Season tile from the Wall during the game, they must reveal it immediately and place it with their melded tiles. The player must then pick a replacement tile from the Kong Box to bring their hand up to the required 13 tiles. The game begins when the dealer discards any one of their 14 tiles into the space in the centre of the Wall. Players must always utter the name of a tile when it’s discarded, e.g. “One of Bamboo” or “Red Dragon”. The play goes from right to left around the Wall, starting with the dealer. This routine is only interrupted when a player claims a discarded tile for a Chow, Pong, Kong or by achieving Mahjong. Each player in turn must pick up one tile and discard one tile, always keeping 13 tiles in their hand, not including Seasons or Flowers. Each player’s objective is to arrange the tiles in their hand into four sets and an identical pair, allowing them to declare Mahjong and end the game. As a player only ever has 13 tiles in their hand, they can only end the game by picking up a tile, either from the Wall, Kong Box or discard pile. Once Mahjong is declared the game ends immediately without a discard having to be made. It is important to remember how the last tile was acquired for points scoring purposes. The most common sets in Mahjong are Chows and Pongs, which each have three constituent tiles. Kongs are unusual in that they contain four tiles but still only constitute one set. This means that when a player uses a tile to create a Kong, they need an extra tile to allow them enough tiles in the rest of their hand to make up the other required sets. These extra tiles are drawn from the Kong Box. There are two ways that a player can pick up a tile; from the wall or by picking up the last tile discarded by another player. The player picks up the next available tile from the Wall. The player keeps the tile if it is useful, and discards a less useful one into the space in the middle of the wall, uttering its name e.g. “West Wind”. The player can discard the tile immediately if it is not useful, uttering its name as it is put in the middle e.g. “Red Dragon”. After a turn a player must have 13 tiles. Any sets resulting from a tile drawn from the Wall can be concealed in the players hand rather than being melded and displayed. Concealed sets score more than melded ones. Instead of picking up a tile from the wall a player may pick up the last tile discarded. This may only be done if the player needs that tile to complete a set or declare Mahjong, and only the last tile to be discarded can be picked up. If the player is using the tile to create a Chow, it must have been discarded from a player ahead of them in the normal order of play. This means that a player can only pick up a discard to complete a Chow when it is their turn. If the player is using the tile to create a Pong or Kong, or to declare Mahjong, they may interrupt play and take the tile they need as soon as it is discarded by any player. Any players between the discarding player and the player picking up their discard will miss their turn. If multiple players claim the same tile the order of precedence is Mahjong, Kong and finally Pong. Having picked up a discarded tile, the player must demonstrate to the other players that the pickup was legal. To do this the entire set which the picked-up tile completes must be taken out of the player concealed hand and displayed face-up in front of the player. The set is then said to be Melded, as opposed to a set Concealed in their hand. Having picked up the tile and displayed the melded set as appropriate, the player must now discard a tile from their hand as usual. The play then passes to the player’s right. Kongs consist of four (identical) tiles, but still only count as one set. This means that when a player picks up the fourth tile needed to turn a Pong into a Kong, the rest of their hand will be one tile short. The player will need to pick up an extra tile to make up the rest of their hand, as the tile they just picked up has effectively disappeared into an already-full set. These extra tiles are taken from the Kong Box, not the Wall. A player who has a Pong concealed in their hand may pick up the fourth tile of that type to create a Kong if it is discarded by any other player, even if another player wants the same tile to create a Pong. The resultant Kong must be melded in front of the player’s hand as with any set completed by picking up a discard. The player then takes an extra card from the Kong Box and play continues as usual. The player who has a Pong concealed in their hand and then draws the fourth tile of that type from the Wall has a problem. Kongs score very heavily when kept concealed, but the player needs access to the Kong Box to balance out the rest of their hand. In order to demonstrate to the other players that they are entitled to take a tile from the Kong Box, a player who draws the fourth tile of a Kong from the Wall must declare their Kong, and meld it in front of their hand as above. The player can turn over one of the tiles in the Kong so it is face down to indicate that it was a concealed hand, rather than an actual melded one. Whoever won the last game is now the dealer. The Personal Winds given to the players don’t change. Shuffle the tiles face down and set up a new wall and Kong Box. Using the procedure laid out in the “Setting up a Game” instructions above. The four Wind tiles and a White Dragon are used to determine the Winds, the player choosing the Dragon sitting out the first session. The player who sits out a session is called the Dreamer. When the player who is East Wind doesn’t go Mahjong they retire, the Winds rotate and the incoming player becomes North Wind. Only the winning player gets points. A standard bonus of 20 is given for achieving Mahjong, but different types of sets also score points and doubling bonuses. Calculating a score is a two stage process; first the basic score is calculated, and then the doubling bonuses are applied. Other players will have to pay the winning player a total based on the points scored and certain conditions of game play. Use the master table below to work out the basic score. The basic score is then doubled for each doubling condition that can be found to apply to the hand. Use the master table below to work out the doublings that apply to the winner’s hand. Download this Score Sheet to record everyone’s winnings and losses. Balls: Thirty-six suit tiles with pictures of Balls numbering 1-9. 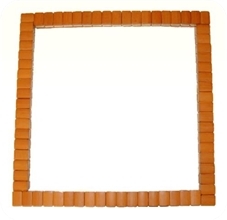 Bamboo: Thirty-six suit tiles with pictures of Bamboo sticks numbering 1-9. The 1 of Bamboo tile is depicted with a bird instead of a Bamboo stick. Bonus tile: The category of tiles composed of Flowers and Seasons. Chow: A set that follows a run from the same suit numbering 1-9. Concealed: A set which is kept hidden in the players hand because it has been created as a result a player drawing the tile from the Wall. Dealer: The player who distributes the players’ opening tiles and begins the game. Discard: The most recent tile that was placed in the middle of the Wall. Dragon: Twelve Honour tiles with pictures of red, green and white Dragons. East: The player who distributes the players’ opening tiles and begins the game. Also known as the dealer. Flower: A set of four different Flowers, each relating to the Wind attached to each player. Also known as a Bonus tile. Honour tile: The category of tiles composed of Winds and Dragons. Kong: A set of four identical tiles. Kong Box: A group of tiles which are separated from the main Wall at the beginning of the game to provide additional tiles for when a player gets a Kong, Season or Flower. Mahjong: A hand consisting of four sets and an identical pair. The first player to achieve this wins the game. Major tile: A tile of any suit numbered 1 or 9. Melded: A set which is displayed openly in front of a concealed hand because it has been created as a result of a player discard or interrupting the flow of the game. Minor tile: A tile of any suit numbered 2 to 8. Numbers: Thirty-six suit tiles with the Chinese character of ten thousand numbering 1-9. Personal Wind: At the beginning of a game each player is assigned a Wind based on their position on the board in relation to the dealer. This has implications on the Honour and Bonus tiles players can collect to maximise points. Points: Every player begins the game with 2,000 points. When a player wins they collect points from the opposing players. Pong: A set of three identical tiles. Prevailing Wind: At the beginning of a game a Prevailing Wind is chosen. This has implications on the Honour and Bonus tiles players can collect to maximise points. Season: A set of four different Seasons, each relating to the Wind attached to each player. Also known as a Bonus tile. Set: A component of a hand, either a Chow, Pong or Kong. Tally: Used to pay points to the winning player at the end of the game. Terminal tile: Another name for a Major tile, a Terminal tile is a tile of any suit numbered 1 or 9. 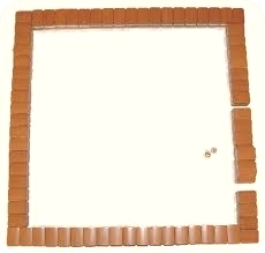 Wall: At the beginning of the game the dealer creates a square Wall two piles of tiles high and 18 tiles long. Tiles are drawn from it during play. Wind: 16 tiles which feature one of four cardinal directions, players can collect their Personal Wind to maximise points. Many thanks to Martin Persson for creating the Mahjong icons. Thankyou! We enjoyed a family game of Mahjong this evening using these rules. I have an ivory and bamboo set from a great uncle. Will give you a game sometime!